Recent studies have highlighted the dangers posed by sugary beverages and there is a campaign proposing that sugary beverages availability be limited within junior schools, high schools and non-government organisations. According to the Cancer Council, a regular 600ml soft drink contains about 16 packs of sugar. This is reason enough to make the healthy choice of drinking tap water. aquafil water refill stations and drinking fountains are ideal for ALL public areas including parks, schools, universities, colleges, beaches, sporting facilities, golf courses, stadiums and shopping centres. 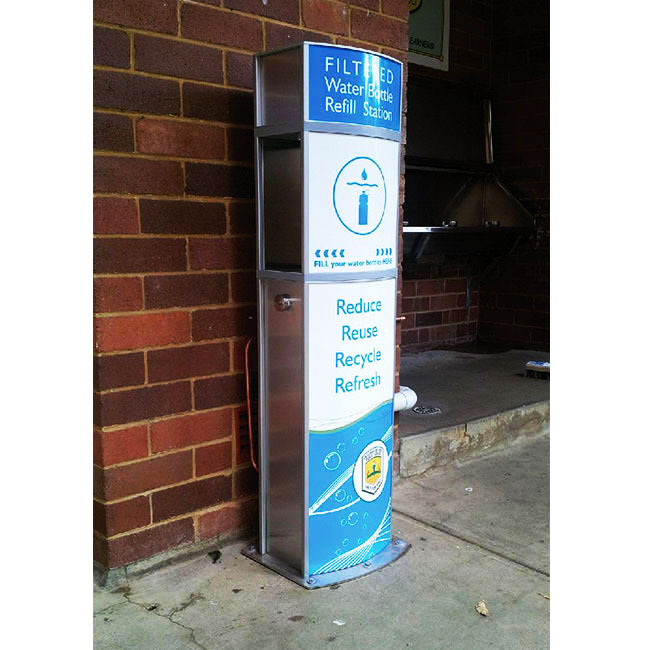 Water refill stations are a practical product that combat the extravagant waste of resources generated by bottled water. The Senior aquafil Pulse water bottle refill station is 1405mm high. It is a robust, vandal resistant compact unit, built to endure the harsh realities of the public environment. The anti-bacterial dispensing nozzles deliver quality filtered and non-filtered drinking water to our communities.